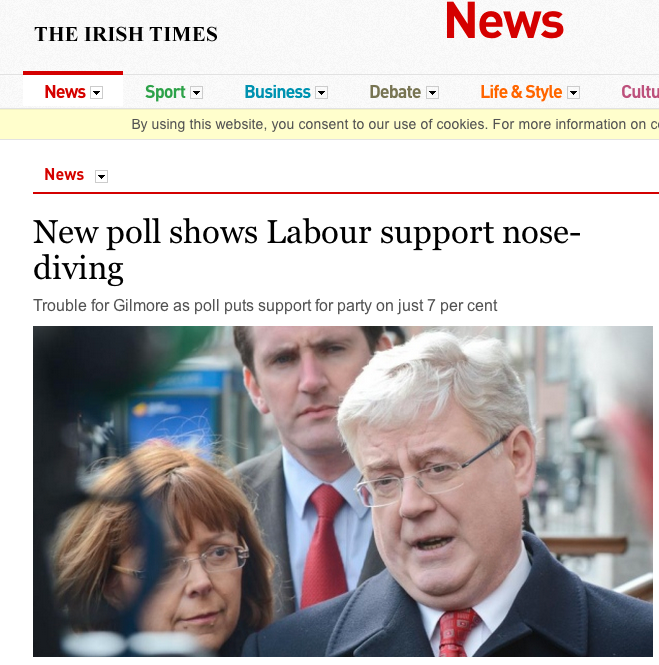 Commenting on a link to Conor Pope, "New poll shows Labour support nose-diving", Irish Times 3/30/2013, B.H. remarks that "If I knew what it was, I might do it for them …"
1912 Flight 31 Aug. 787/1 The machine at once started a spiral nose-dive. 1917 ‘I. Hay’ Carrying On i. 17 Next moment she [sc. the aeroplane] lurched again, and then took a ‘nose-dive’ straight into the British trenches. Note that the joke is better in varieties of English that use plural verb agreement with singular collective nouns like "Labour". Yes, I had to re-read it with that in mind to get the joke. @Oskar: you can read it as "a new poll shows that Labour support [the action known as] nosediving" rather than "a new poll shows that the support for Labour is nosediving". Also – these 'joke' readings only ever seem to occur to north American readers – for me this is not obviously ambiguous! Martin, as a native British English speaker I found the joke funny enough although obviously I probably wouldn't have stumbled at interpreting this headline if I saw it in its natural habitat. As to the "Irish Times" being a giveaway, I suspect you significantly overestimate the extent to which non-locals are even aware the Republic exists. Likewise, the chances of non-locals knowing Gilmore is the leader of the /Irish/ Labour Party (or indeed knowing the name of the present leader of the British Labour Party without Googling) are slim. They've maybe heard of Ireland, but only in the same vague way that people have heard of Patagonia (not a country) Tibet (ditto) or Southern Sudan (now finally a country under the name Republic of South Sudan). So why shouldn't this just be one more regional newspaper from the United Kingdom? They speak English, they're off the left hand coast of Europe, must be British right? People's knowledge of political geography, when it's not completely non-existent, tends to become rather stale. The wording in the subhed "on just 7 percent" (rather than, say "at just 7%) seems very bizarre to me and probably ungrammatical, but perhaps that's just an AmEng/IrEng distinction? The only thing left unexplained is why Prof. Liberman is against nosediving. It's not clear that it's "nosediving" as opposed to "nose-diving," analysed on analogy to apple-picking (or nose-picking). I would consider supporting diving for noses under some circumstances. And Australians think our Labor (sic) Party is unpopular, with ratings in the 30% range. I don't think it's any wonder that the other parties made up mythological-sounding gaelicised names for themselves (Sinn Féin, Cummann na nGhaedhal Fine Gael, Fianna Fáil). As basically conservative (at times bordering on clerical-fascist) nationalist parties, they were all competing to be the true heirs of some posited ancient Irish identity. In contrast, when the Irish Labour party was founded in 1912, socialist movements all over Europe had fairly genuine aspirations to being internationalist. The British Labour Party represented the radical opposition to all things imperial and capitalist, so it was hardly identified with the oppressor. And finally, Ireland had only a small industrial sector and both its bosses and the proletariat were firmly anglophone. At least three of the Irish labour movement's founding leaders had been born in Great Britain: Connolly, Larkin and Johnson. For all these reasons, Irish Labour probably didn't find having an Irish name to be such an essential part of their identity as the others did. The Australian Labour Party officially changed its name in 1912 to the Australian Labor Party, as an act of anti-colonial solidarity with the American labor movement. But perhaps anti-colonialism was shared across the political spectrum in Australia a century ago, since they called their parliamentary chambers the House of Representatives and the Senate (not the Houses of Commons and Lords), and imported a young architect from Chicago to design their new capital city. The Irish Labour Party can also be called Páirtí an Lucht Oibre, but that generally happens only in an Irish-speaking context. Continuing this slightly OT discussion I think it's characteristic that the Irish name just means "the party of the working people", which is a positively sober and pedestrian title compared to the other 3. There is an opinion poll every couple of weeks in one or other of the Irish media organs. Reporting the state of the parties in an opinion poll is similar to reporting the state of the teams in a soccer league. Last week Liverpool were on 56 points, Arsenal were on 53, and Chelsea were on 48. This week Fianna Fáil are on 27%, Fine Gael are on 22%, and Labour are on 7%. mollymooly: "Liverpool were on 56 points" is impossible in American English. We'd say they had 56 points (or present the standings in a table). However, you've cleared something up for me. The only foreign sports coverage I read is about chess. I've occasionally been surprised by "GM Whoever is leading the tournament on 5.5/7", but now I know that's used in some varieties of English—I imagine not just Irish. Considering how many countries have labour parties, I (as an American) guessed that it was referring to a labour party by default.